The worldwide financial crisis has wrought deep changes in capital and labor markets, old-age retirement systems, and household retirement and consumption patterns. Confidence has been shaken in both the traditional defined benefit and defined contribution plans. Around the world, plan sponsors, fiduciaries, policymakers, and households have gained a new awareness of retirement risk. When pressed to reform post-crisis, many would recommend enhancing financial advice for plan participants, emphasizing flexibility and the positive effect of working another one or two years to make up for investment losses in the downturn. Adding to this is the continuing need for financial education, essential as the retirement system moves increasingly toward personal account pensions. Perhaps most important of all is the need for greater understanding of risk throughout the retirement security system, along with new approaches to re-engineering retirement pensions. 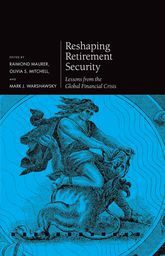 This volume explores the lessons to be learnt for retirement planning and long-term financial security in view of the massive shocks to stock markets, labour markets, and pension plans resulting from the financial crisis. It aims to rethink retirement in the new economic era, including the resilience of defined contribution plans and how defined benefit plans reacted to the financial crisis. Chapter 13: How Have Public Sector Pensions Responses to the Financial Crisis?